In this post we’ll take a look at some Qt-based file managers. Since there’s quite a lot of them, let’s start right away! If anybody can get one or more of these to work on Arch, please let me know (send me PKGBUILDs?). And also tell me if you think that I forgot anything interesting! For this test I’m using the same VM as in my previous Qt application test. I haven’t updated it since then. Andromeda is a cross-platform file manager based on Qt. Dfilebrowser is a Qt file manager meant for mobile devices – but of course it works on the pc, too. Dino is simple Qt file manager that does however come with some nice features (like a built-in text editor and such). Dolphin is the standard file manager of KDE. As such it has a lot of dependencies and is very heavy! 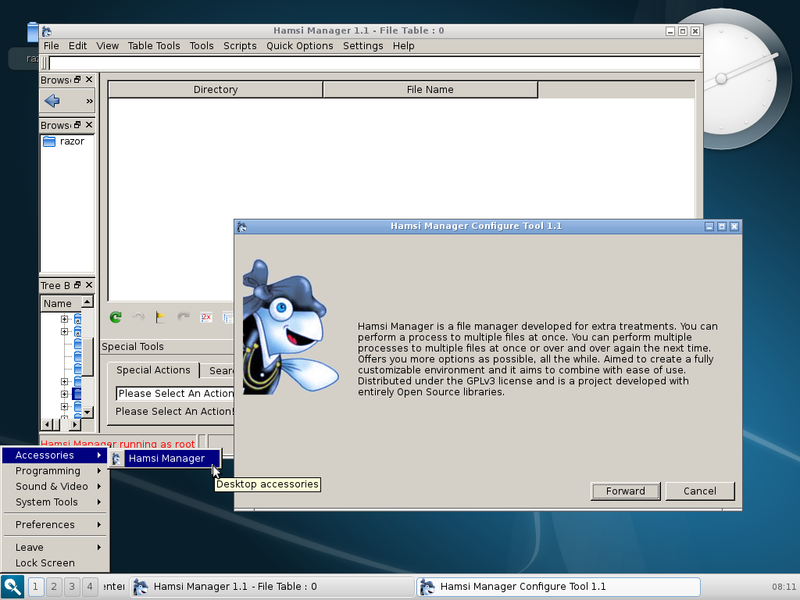 The Hamsi Manager is an advanced Qt file manager with a lot of extras. NewBreeze is a reasonably light-weight Qt file manager. QtFM is meant as a light-weight Qt file manager but it is already a bit on the heavy side. However it’s rather feature rich. 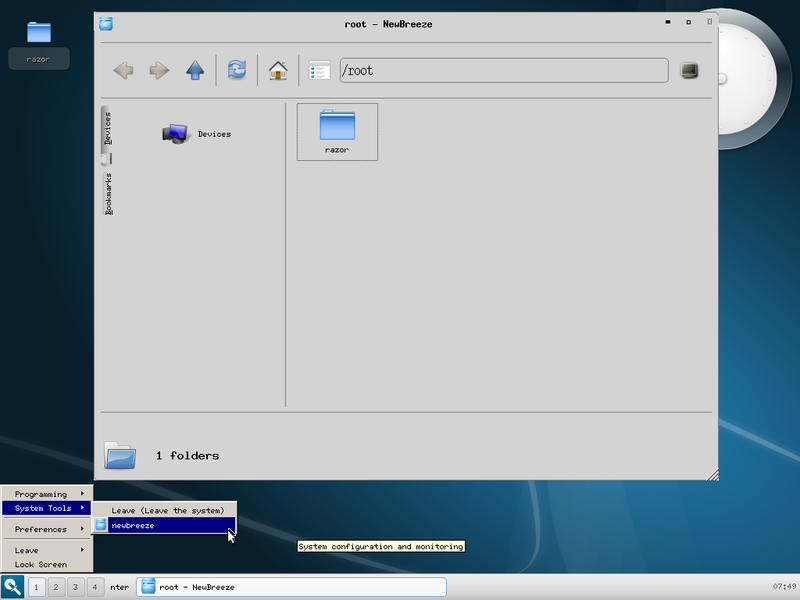 ScOpe is the file manager that belongs to the “Sapphire Desktop” project. It’s developed with focus on usability. Since all these values can be a bit confusing, I’ll dedicate another post to the file managers. The next one will feature a table so that comparison is easy. That’s why this post goes without a conclusion for a change. Alright, finally time for a new entry! I got a nice new laptop – my first one that came Linux pre-installed. It’s currently running Mint (which is ok, I guess, since my wife uses it, too). I didn’t find the time to crawl through all the GB of my old data, so I don’t have everything back to normal, yet. But let’s start with the promised qt-applications test anyways! QTerminal is a more light-weight, tabbed terminal emulator based on Qtermwidget. There’s something wrong with the font height on my system, so the console text looks weird. Next we’ll take a look at file managers based on Qt. There are LOTS of them, so the next post will be far longer than this one! On from December 3rd WordPress is no longer counting just page views but unique visitors as well. This is of course a great new feature (which I admit to have missed the whole time). But since it’s not been available for too long, I won’t write about any details in this post. The number of visitors has increased a lot: In late September my page hits had just reached 250 – now the blog has been visited well over a thousand times! The days without any visitor had also vanished and I had hits every day for more than two month. The most impressive number of visitors was November 6th. I barely believed my eyes: On this ordinary Tuesday I got 40 (!) hits, all out of the sudden. Just as unexpectedly this new peak was already surpassed with 41 hits on November 15th! Altogether November was by far my best month, yet: I just barely missed 300 hits in that one month (and thus more than I scored in my first three complete month together)! December hits were a little lower than those in November, but 235 is still better than October with 190. Top visiting countries are of course also a nice thing to know. 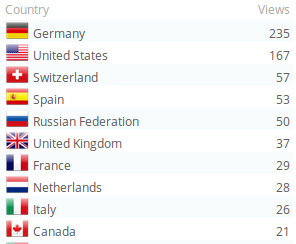 Since post #15 the top 5 countries changed a bit: 1) Germany, 2) USA, 3) Switzerland, 4) Spain, 5) Russia. I didn’t use tags and categories right from the beginning but somewhen in October (I think) I decided to finally add them to all posts (the old ones, too). 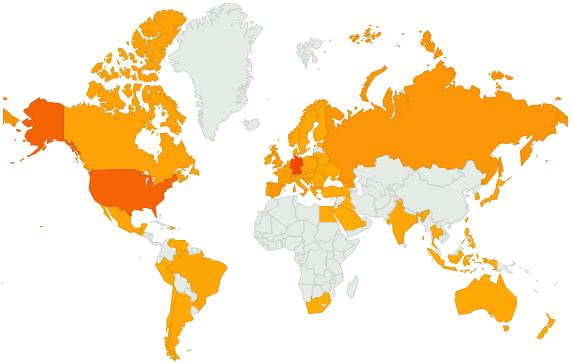 So this is also an interesting reflector on what my visitors are interested in the most. I won’t comment on that as it speaks for itself. 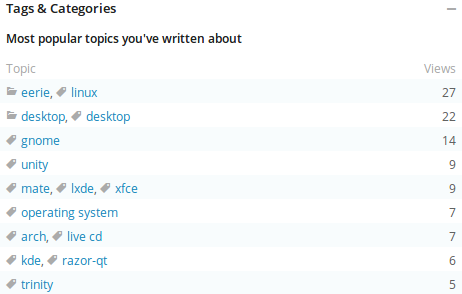 Just as I expected, still most backlinks refer to one of the desktop testing entries. When it comes to search engines, EERIE was mostly discovered by Google (various localized variants) or Duckduckgo. 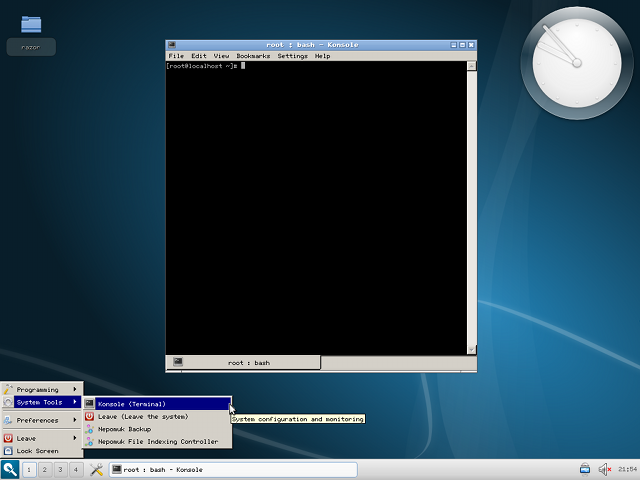 what is the lightweight desktop environment for linux? Of course many more terms were actually referring to what EERIE is really about. Most people were searching for a comparison between the various desktop environments and their requirements (especially memory usage) or a comparison between the toolkits. The first year is over and altogether I’d say that 2012 was a very productive first year for the blog. I learned the basics of WordPress and found a fitting distro for my tests (Arch). The desktop comparison series was written and the first preview version of the DesktopDemoDVD published. While I can’t promise when I’ll be able to resume work on EERIE, I do promise that I will as soon as possible. I’m really curious how the various programs built on different toolkits do when compared to each other! I’ll start with some posts about Qt applications. Then GTK+, Motif and FLTK will follow. And once we have the most light-weight programs of every TK, we can move on to compare the best ones. But there’s a lot of work to do in the process! Stay tuned.